A lovely card and beautiful images too. Thank you for joining us at Crafty Hazelnut's Patterned Paper Challenge. I totally LOVE this card Janis - it's soft, gentle and just perfect for the 60th Wedding Anniversary celebration. This is really lovely Janis you've done a wonderful job on it as always. So glad you got to combine the celebrations with a visit with your Dad. My father is 87 and hasn't been well all summer. Although he is home we recently learned he has advanced liver cancer and has approx. 2 months left. We cannot take this time for granted, for sure! Oh,that is beautiful! I love the birds!!! This is just exquisite! Those papers coordinate so well and the fussy cutting was completely worth it. The birds seem to fly off the paper in celebration! 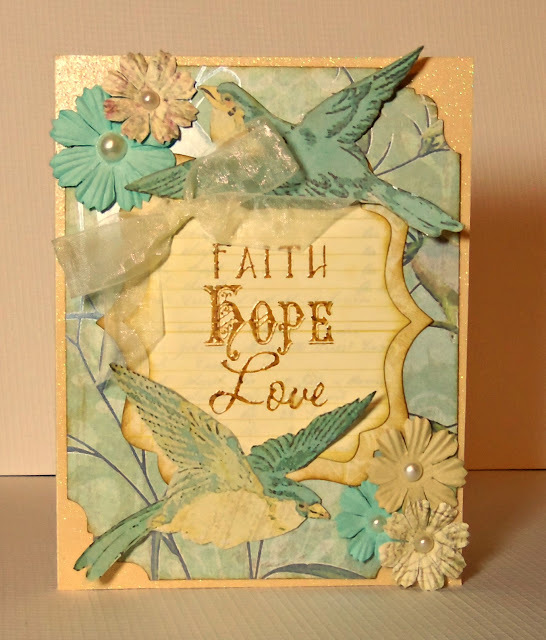 Loving the die cut labels and inked edges for a really sweet vintage look.